The TOEFL® test measures English language proficiency in speaking, listening, reading, and writing at the college/university level. It has four sections: Reading, Writing, Listening, and Speaking. However, you will also be required to combine skills in these four areas to correctly answer the questions. 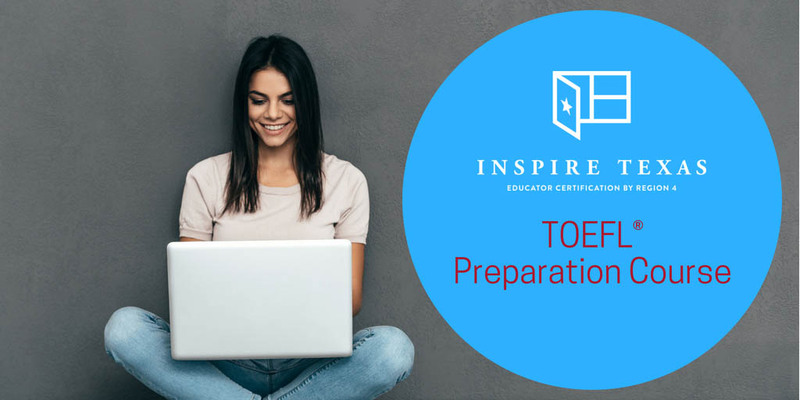 Get an edge and real experience with our interactive TOEFL test questions. Our preparation course is ideal for the person looking for real-time feedback and classroom-like instruction. We guide you every step of the way. Questions? : Email us at info@inspiretexas.net or rebecca.hampton@esc4.net. The TOEFL iBT Online Review is a six-week course that will prepare you to take the internet-based test. The purpose of this course is focused On the four language skills tested in the exam: reading, writing, listening and speaking. During the six-week course, you will develop specific strategies to address each skill in the test and will be exposed to the format of the exam. You will participate in six virtual classes of 3 hours each (18 hours total during the six-week course) with an instructor who will provide immediate feedback during the live activities. This course is completely online and contains six (6) modules. One module per week will be studied. The modules should be completed in order. Please review the TOEFL iBT Course Calendar and Checklist for the schedule of when each module should be completed.